Occurrence: As fruit, juices, jams, jellies, preserves. Like many other allergies to fresh fruits and vegetables, plum allergy can take two different forms. In the North of Europe, people with birch-pollen allergy can develop a plum allergy due to the similarity between a protein in birch that causes birch-pollen allergy, and a plum protein. This is called the birch-fruit syndrome with symptoms generally appearing within 5-15 min after consuming raw plum and comprising local reactions in the mouth and throat with itching and inflammation (called oral allergy syndrome, OAS). The molecule, known as an allergen, involved in this kind of allergy does not survive cooking. Therefore, people who react to this allergen can tolerate cooked plum. Individuals often develop adverse reactions to other fruits including apple, pear, apricot, cherry, melon, banana, nuts such as hazelnut, or vegetables such as celeriac (celery tuber) and carrot. In Mediterranean countries, people with plum allergy do not have birch-pollen allergy. Instead they often have allergy to peach. Symptoms are more severe including generalised urticaria, abdominal pain, vomiting and life-threatening symptoms, sometimes in addition to the OAS. These individuals tend to have more frequent and severe reactions when fruits are eaten with the peel. They also tend to develop adverse reactions to other fruits including apple, peach, apricot, cherry and nuts (such as hazelnut and walnut). The allergen that causes this kind of allergy is tough and the allergenicity survives in processed foods such as juices. 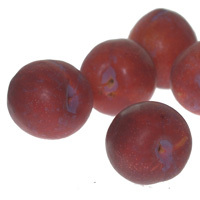 As a result, individuals with this kind of allergy cannot eat even cooked plum. Pastorello et al. 1994  used histamine dihydrochloride (10 mg/mL) as a positive control, and the glycerol-containing diluent of the prick solution as a negative control. A wheal graded at least 2+was regarded as positive. SPT were carried out on the volar side of the forearm with a sterile, 1 mm-tip lancet pricking through the drop of the extract. Readings were taken after 15 min. Histamine (10 mg/mL) and saline solution were used as positive and negative controls repectively. Wheals with a diameter below 50% of the positve control were considered negative. (Asero et al. 2000) . All patients of Pastorello et al. 1994  showed a positive SPT. The proteins were electroblotted to a nitrocellulose membrane, pore size 0.2 to 0.45 µm using a Trans-Blot Cell. The membrane was blocked with phosphate-buffered saline pH 7.4 with 0.5% (v/v) Tween 20 and incubated with the sera (diluted 1:4, v/v). The IgE-binding components were detected with iodine 125–labeled anti-human IgE antiserum diluted 1:4 (Pastorello et el. 1994) . 87% of sera (14 of 16) of Pastorello et al. 1994 , showed Ig E binding to a 13 kDa protein and 77% (14 of 18) to a 30 kDa protein . The other IgE -binding components were: 70 kDa (5 of 16, 31%), 20 kDa (6 of 16, 37%), 14 kDa (6 of 16, 37%), 40 kDa (6 of 16, 37%), 30 kDa (3 of 16, 18.7%) and 48 kDa (3 of 16, 18.7%). These bands were detectable in all but one patient with negative responses to birch pollen. Patients chewed the fruit for 1 minute and then spat it out. If no symptoms appeared within 15 minutes, the challenge was repeated with increasing amounts from 250mg up to 64 g. Patients were asked not to spit out the last two doses but to swallow the fruit instead. (Pastorello et al. 1994) . The same protocol was used by Pastorello et al. (2001)  but using doses from 4g up to 64 g.
Clinical cross-reactivity among foods of the Rosaceae family. Pastorello EA, Ortolani C, Farioli L, Pravettoni V, Ispano M, Borga A, Bengtsson A, Incorvaia C, Berti C, Zanussi C.
Allergenic cross-reactivity among peach, apricot, plum, and cherry in patients with oral allergy syndrome: an in vivo and in vitro study. Asero R, Mistrello G, Roncarolo D, de Vries SC, Gautier MF, Ciurana CL, Verbeek E, Mohammadi T, Knul-Brettlova V, Akkerdaas JH, Bulder I, Aalberse RC, van Ree R.
Lipid transfer protein: a pan-allergen in plant-derived foods that is highly resistant to pepsin digestion. Pastorello EA, Farioli L, Pravettoni V, Giuffrida MG, Ortolani C, Fortunato D, Trambaioli C, Scibola E, Calamari AM, Robino AM, Conti A. Characterization of the major allergen of plum as a lipid transfer protein. Nature of main cross-reacting proteins:There is extensive evidence of cross-reactivity amongst lipid transfer proteins from Rosaceae fruit (including apple, peach, apricot, cherry, plum, and pear) (Pastorello et al. 1994) . Allergen properties & biological function:Plant nonspecific lipid-transfer proteins are thought to be involved in transport of fatty acids both intracellular and extracellularly and of cutin monomers to the cuticular layer of leaves and fruits. There is an expandable cavity between the four alpha-helices which can bind one or two lipids. nsLTPs have also been reported to act as plant defense proteins against bacterial and fungal infections and form the PR14 family of pathogenesis related proteins. (Lindorff-Larsen et al. 2001 ). Lindorff-Larsen K, Lerche MH, Poulsen FM, Roepstorff P, Winther JR. Barley lipid transfer protein, LTP1, contains a new type of lipid-like post-translational modification.